EOS5D | m-arx and the world. What’s in my bag shot. Click the image for a description of the items seen here. 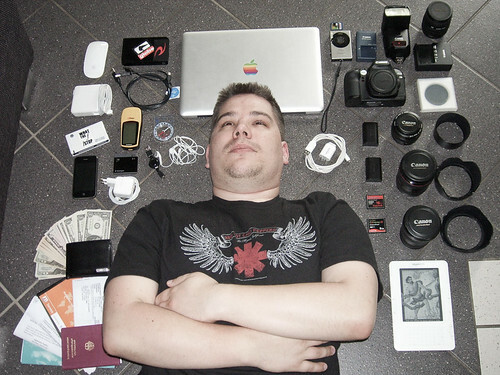 This entry was posted in Travel, USA-Trip 2010 and tagged "Carry on", "iPhone 3Gs", "las vegas", "los angeles", "Markus Meier", "Mighty Mouse", "san francisco", "what's in my bag", 3Gs, 430EXII, Amazon, bag, Battery, Book, CA, Cable, california, Camera, Canon, Cash, CF, Compact, Documents, EF1740F4L, EF24105F4L, EOS, EOS5D, EOS5DMkII, external, Fisheye, Flash, Geocaching, GPS, HDD, Headphones, holiday, Hood, iPhone, Kindle, las, lax, Lens, m-arx, Mac, MacBook, MacBookPro, Markus, may, Meier, MkII, Money, Passport, Pro, sfo, summer, TOKINA1017, Travel, USB, vacation, what's on May 13, 2010 by m-arx.